All MAINLAND OAKS homes currently listed for sale in San Antonio as of 04/22/2019 are shown below. You can change the search criteria at any time by pressing the 'Change Search' button below. "Many NEW and RECENT upgrades!! New Roof, NEW HVAC, NEW carpet, freshly painted and ALL appliances convey! This beautiful and spacious turnkey home with open floor plan and downstairs master bedroom features a HUGE kitchen perfect for entertaining formal and informal gatherings. Enjoy the generous sized gameroom upstairs which can also be used as an extra bedroom, craft room, office or anything else you may need. This floorplan combines the best of everything you want and need, all that's missing"
"Located in Mainland Oaks, this 4/2.5 home has room for everyone with three living areas, spacious bedrooms and roomy walk-in-closets. 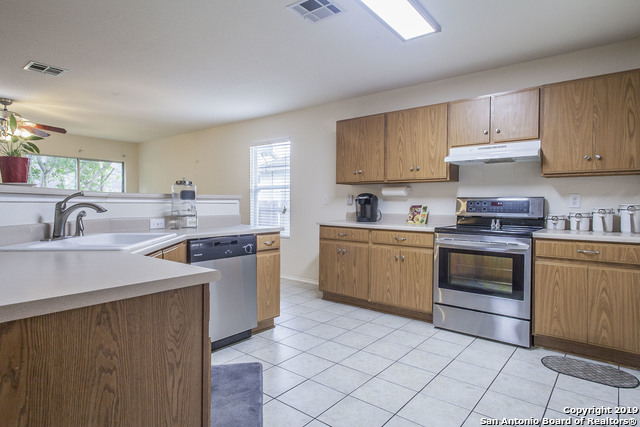 Large eat in kitchen includes an island, stainless steel appliances with plenty of counter space & cabinets. Master suite is very generous in size. Master bathroom has a separate garden tub & shower, and a double vanity. Per seller, recent upgrades include new paint, new flooring downstairs, new roof (winter 2016), new hot water heater and garbage disposal.Come se"
"Wonderful opportunity to live in this great location! Convenient to Bandera Rd,Loop 1604, The medical center, and more! Enter into spacious living/ dining and grande staircase. Enjoy entertaining in large kitchen with granite counter tops leading to dining/bar and family room. 1/2 Bath off of garage. Upstairs, you'll find a loft area leading to your master suite, along with 3 more bedrooms(one could be a second master)and another full bath. Homes move quickly in this sought after subdivision! W"